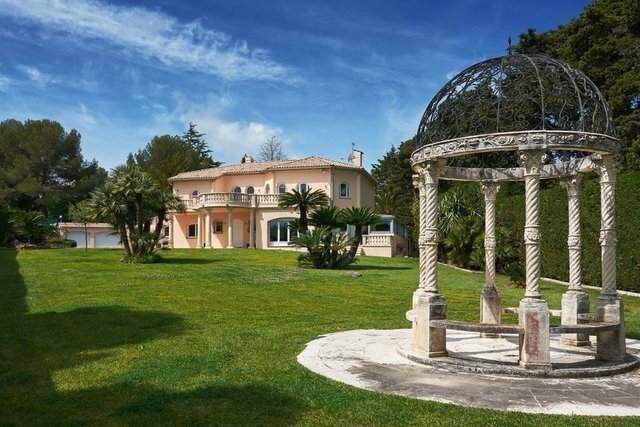 Recently renovated villa, at close proximity to the beaches of La Garoupe. At the heart of a landscaped garden measuring 3,800 sq.m with swimming pool and pool house, large patios and a beautiful terrace with sea view, this villa offers fantastic outdoor living spaces. Built over 3 floors with 5 bedrooms, including a Master bedroom with dressing, ensuite bathroom and a spacious terrace facing the sea, as well as a 1 bed annex with an independant entrance. The villa offers an entrance hall, an open plan living area with fireplace, a dining room, a fully equipped kitchen and an immense basement with a gym area, cinema room, a games room, 2 cellars and a built-in safe. The garden boasts a basket ball court, and a technical room for the swimming pool with shower and toilet facilities. Electric gates, alarm system and video surveillance. 3 door garage.